Campaigns are one of the most cardinal way to reach out to customers. The more the flexibility available with scheduling the campaigns, the more powerful it becomes in terms of reaching out to the customer via the right channel and at the right time. One of the aspects of this flexibility is being able to decide when (day, time) to execute these campaigns. An example of this would be that as a marketer I want to reach out to my customers/prospects only during certain days (perhaps not on weekends). Also, not only on certain days but also only during certain times e.g. 8:00 am to 5:00 pm only. 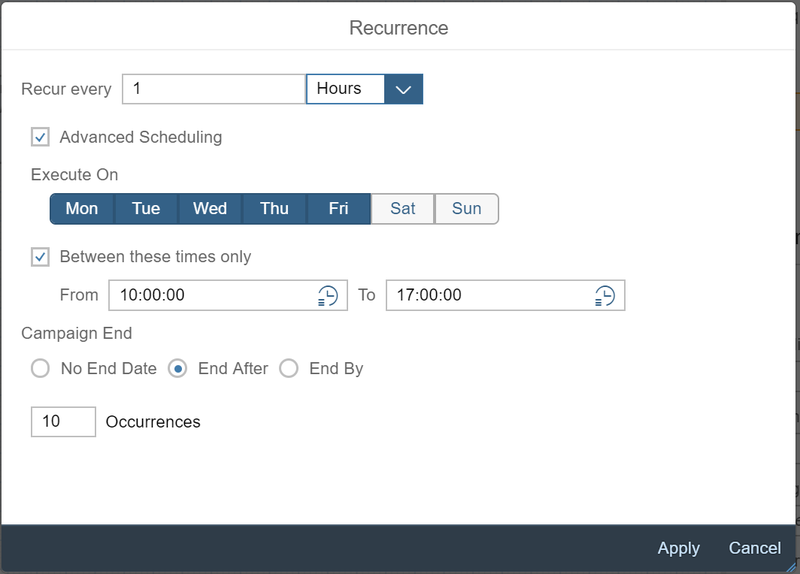 With the feature of advanced scheduling available with SAP Hybris Marketing Cloud in 1708, the marketer gets options for campaign execution. For recurring campaigns running on Hourly/Daily basis, there are additional options available for the marketer. I can choose which days to run the campaign. I can decide during which time range to run the campaign (available for Hourly running campaigns). No End Date: The campaigns runs forever. End By: Specify the date by when the execution ends (i.e. the End Date of the campaign). The system presents a summary based on the scheduling options chosen so that the marketer is assured of the options chosen. With this we bring additional flexibility while scheduling the campaigns. By default, the time information shown for the user is as per the time zone of his system (i.e. computer/laptop). For e.g. if I am in Indian timezone I would see the time information as per Indian time zone. 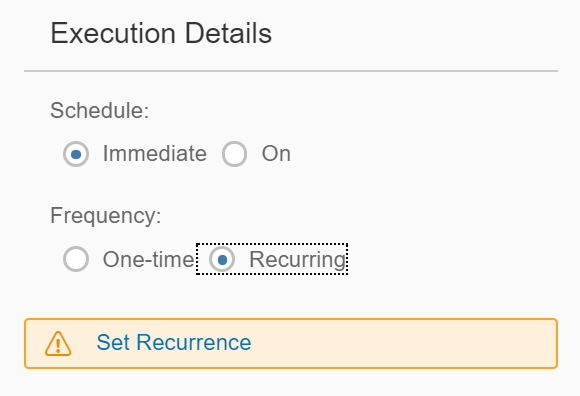 This is the case for all the relevant fields like Last Execution, Next Execution and Schedule On (also for time set by Calculate Best Sending time option). This is also true while I set the Recurrence options for the campaign I am creating. The only exception to this is the Advanced Scheduling summary. The summary explicitly mentions the timezone information. This time zone is always the one of the creator of the campaign or the time zone of the user who last updated the recurrence details of the campaign. 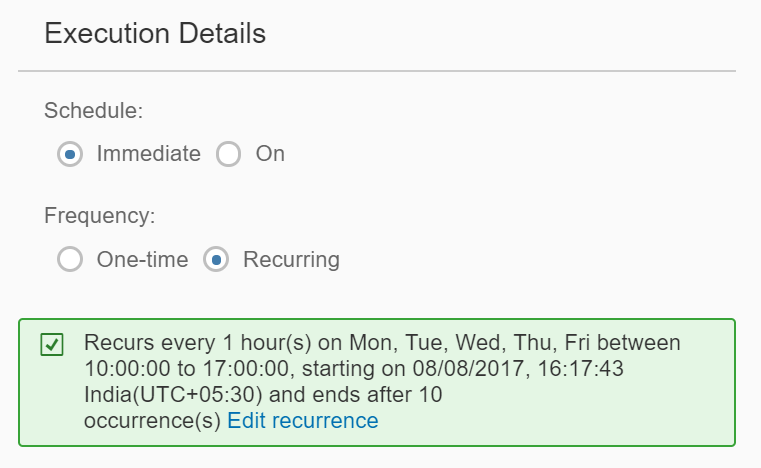 This is done specifically to keep the scheduling information consistent across all users no matter whether in same or different time zone. This uniformity makes it easier when multiple users across different time zones collaborate & discuss over the same campaign especially w.r.t the recurrence information. Let’s look at it with an e.g. of a campaign. I am a marketer in Indian time zone. I have created a campaign and scheduled it for future (24th August in this case) at 13:00. I have set a frequency of 10 hours. Also, I would like to have this campaign run only on Mon-Fri (not on Sat/Sun) only between time range of 8:00 to 22:00. The Last Execution/ Next Execution are blank as of now. The summary information is shown still in the created/last updated time zone (in this case it is Indian time zone). As described above, this is to give a consistent view for all users w.r.t the recurrence information. However, to make it easy to find as to when was the Last Execution or When is the Next Execution, this information is as per the local time zone of the user who is viewing i.e. Pacific time zone. This helps the user and avoids the need for the user to calculate manually the times as per his local time zone. And the user can precisely see how long back the last execution happened or in how much time is the next execution as per his local time. This is done as we all work best with our local time zone information. Do you know if the person is segmented into a Live Target Group on a weekend (Sat/Sun), will the email still be sent to them on Monday? Nice Blog , Thanks for sharing this!